It is very common in rugby union to see players wearing a form of headgear known as the “scrum cap”. 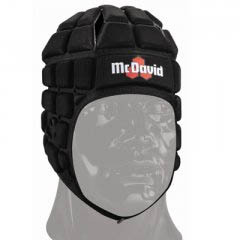 This is intended simply to protect the ears of a player who is engaged in the scrum. Swollen ears left untreated, lead to the condition commonly known as ‘cauliflower ears’. The traditional scrum cap is a thin cloth helmet with padding over the ears and held in place by a strap. Because of the close contact, buckles cannot be used. Players will often opt for a thin strip of cloth bandage held in place by electrical tape like a head band. Other players have taken to wearing padded headgear as well as forwards. This protects them from head injuries from accidental contact in play. headgear is strictly controlled by Regulation 12 of the IRB and must be made from as being made of soft, thin materials. Plastics are not permitted. The same Regulation 12 sets out testing standards for this equipment and it must carry an IRB approval logo. Whilst they may prevent some cuts and abrasions, such headgear has not been shown to stop the player suffering from concussion but it greatly reduces the pain that occurs when players knock heads.